Well, the remodeled 7-Eleven/Kwik-E-Mart promotion is supposed to be over. There are still some holdouts here and there, and there’s still plenty of Simpsons products within the 7-Elevens themselves, but I think the remodels are coming down. I never got to go to one, but my in-laws and a good friend of mine went to remodeled 7-Elevens in Texas and Nevada for me then sent me pictures and a few other surprises. What surprises you ask? Well, below you’ll find some of the treasures my mother-in-law sent to my doorstep after I asked her to check out the Dallas Kwik-E-Mart for me. You can click some of the images below to get a bigger version. A big pile of the awesome, awesome stuff that my in-laws sent me from Texas. Cookies, books, comics, etc, etc. Lots of awesome here. Too much awesome, actually. I almost don’t deserve it……I take that back, yes I do. On the Simpsons, the Kwik-E-Mart sells their version of the Slushee called a Squishee. 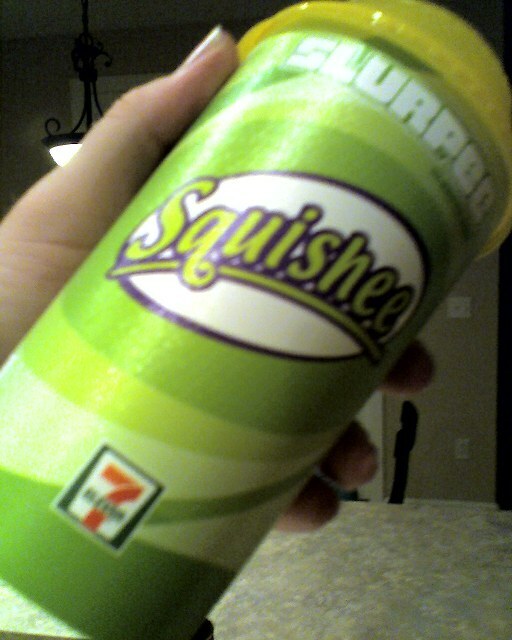 For the promotion, 7-11 rebranded their Slushee drinks, Squishee, and offered drinks in these cool collector cups. 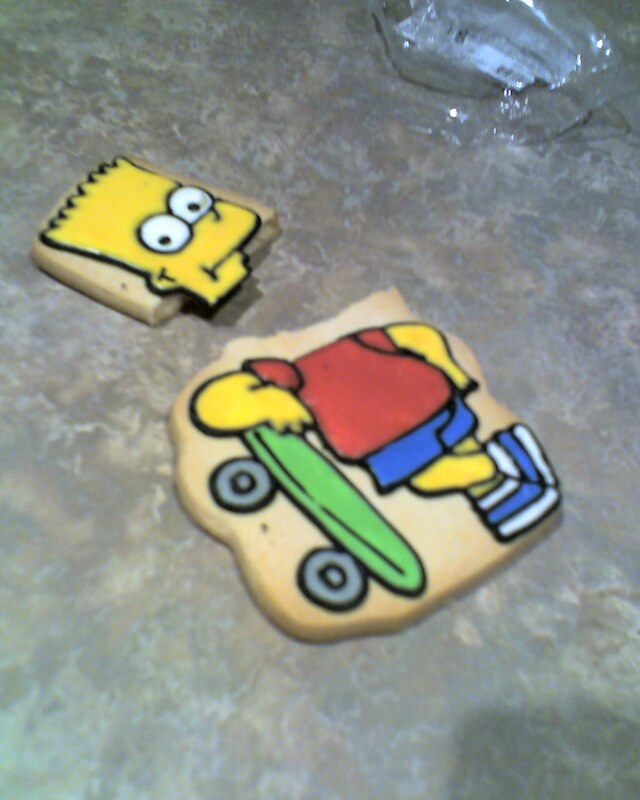 Bart Simpson cookie. I also got a cookie of Homer Simpson’s head. You can see it in the first picture up top. 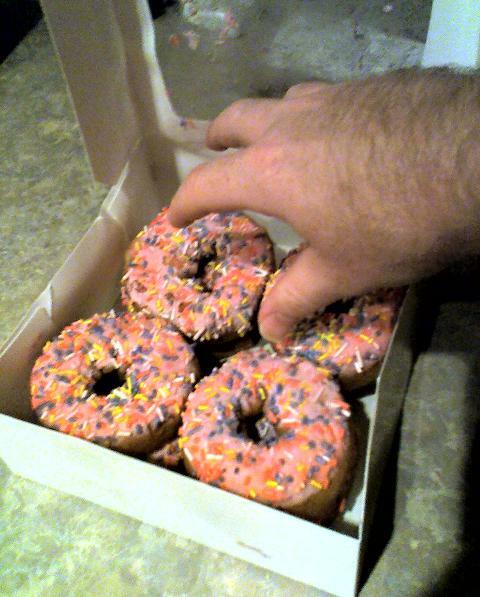 Homer’s favorite food, donuts with pink frosting. I can see why he loves these things. They are like tiny baked circles of Heaven. Instead of the usual glazed donuts that Homer eats, these were actually cake donuts. I think they may have been better than the glazed. They were deeeeeeelicious….uuuuuuummmmmmmmm……………dooooooonuuuuuuuts. The pictures from here down all come from my good friend Mitzi. She went on a West Coast trip recently and went to the remodeled 7-11 in Nevada. These are my favorite of the pics she sent me. Thanks Mitzi. 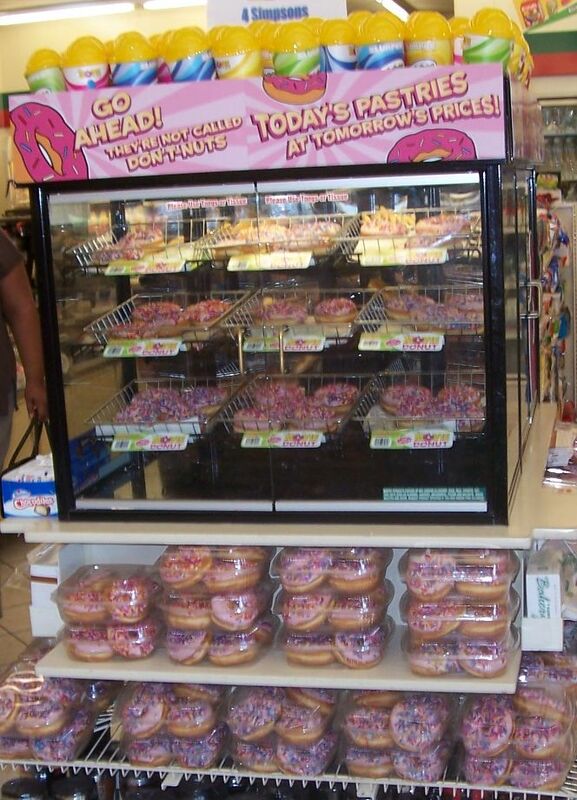 Here’s the display for all the pink frosting donuts. Tell me this does not cause your eyes to glaze over (pun intended) and your mouth to drool. Looks. So. Good. Click on this image to see the bigger version then check out to the left of the donut display. You can see a tiny blue and white box of Chocodiles. I didn’t know Hostess still made those. I want one! 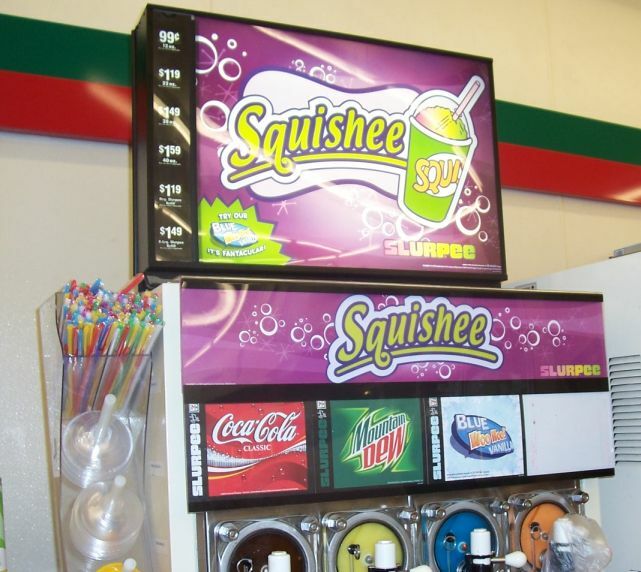 Like I said earlier, the Slurpee machines were re-branded with the Squishee name. They even added a new flavor, Blue Woo Hoo Vanilla. Nice name. 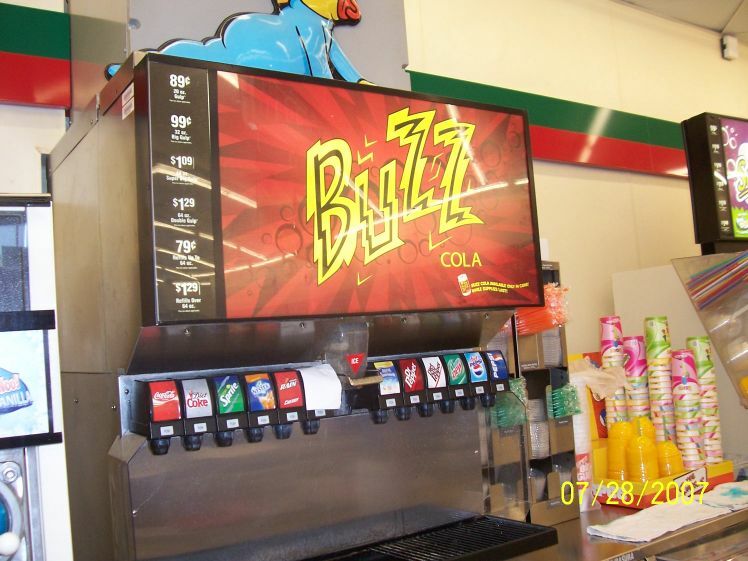 The soda fountain was covered with ads for the Simpsons-only cola, Buzz. It wasn’t in the fountain, but 7-11 was offering cans of Buzz Cola in their coolers. My in-laws got me 2 cans of Buzz Cola. I tried it, and it was awful. Tasted like watered down, bitter RC Cola. Not cool. Although 7-11 did carry Buzz Cola, they did not carry the Simpsons-only beer, Duff Beer. How great would a can of Duff Beer be? Well, if it tasted anything like Buzz Cola, it wouldn’t be great. But, I’d keep the can. I see Duff Beer as the Simpsons equivalent of Miller High Life. 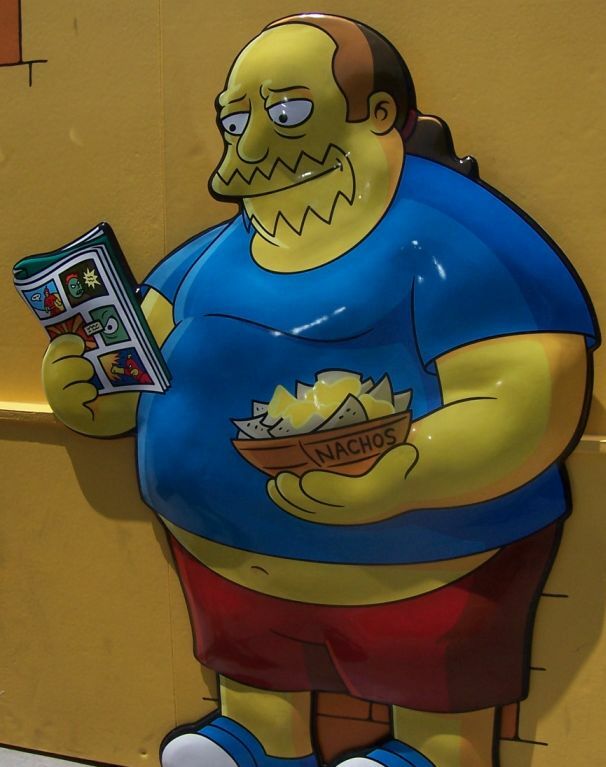 One of my favorite characters on the Simpsons is Comic Book Guy. His snarky comments whenever he is on screen reminds me of a comic shop guy when I was in high school (yes, I collected comics). Some of his best quotes; “Your emotion is out of place here, son.”, “Worst episode EVER.”, “I must hurry back to my comic book store, where I dispense the insults rather than absorb them.” He’s endlessly entertaining and he’ll pop up randomly in episodes. More Simpsons product on sale. You can see the pink donuts on top, the Bart and Homer cookies below that. The Squishee cups are on the bottom (you can see different colors). You can’t see any boxes of Krusty-Os cereal that 7-11 was also selling. These were a hot item and most 7-11s ran out very quickly. Unfortunately the Krusty-Os were all sold out at the Dallas Kwik-E-Mart where my in-laws went, so I didn’t get a box. However, I read that it was pretty much just Fruit Loops. Having the box would be cool, though. 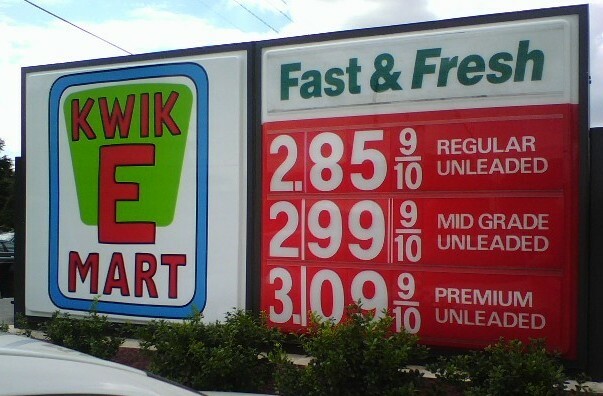 A picture of the front of the Nevada remodeled 7-11. I love the idea of having life-size simpsons standees all over the place. Really puts you in that world. Well, much thanks goes to my in-laws, Kathi and Dan, and my friend Mitzi for sending me the awesome pictures and cool Simpsons swag. I really wish I could have gone to the one in Orlando but a 2.5 hour trip one way is tough to justify for a trip to a 7-11. However, I’m going to Orlando in the next few weeks with my wife and friends for our annual trip to the Epcot Food & Wine Festival. We shall see if the 7-11 remodels are still standing. There’s also a giant McDonald’s right off the interstate that I want to get a look at. FYI…Mitzi is a really good photographer. She has great pics of her West Coast trip up at her Myspace page. Check them out. On July 27 the long awaited (10 years in the making) Simpsons Movie will hit your local theaters. I haven’t watched the show in a few years but I am still pretty excited about seeing the movie. Some of the older shows are just classics. 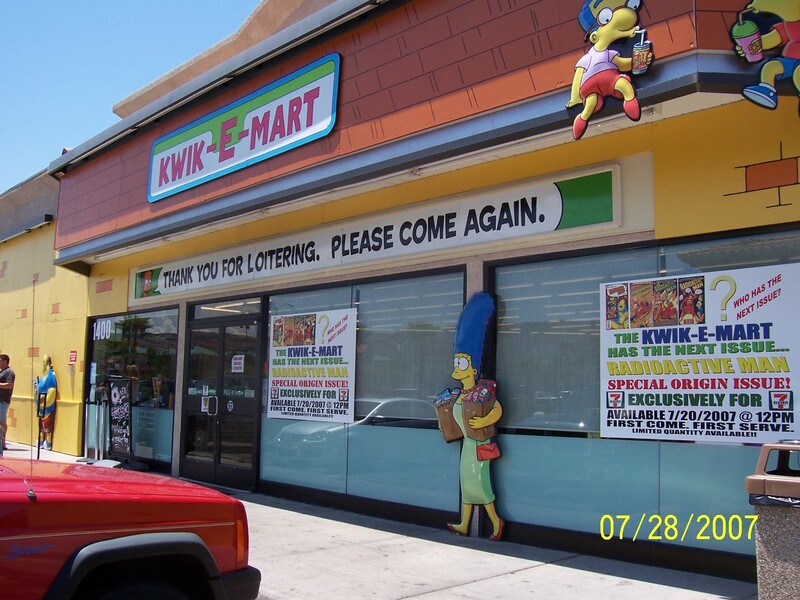 Anyway, this morning I was reading a few of my favorite pop culture blogs and I found out that, over this past weekend, ten 7-11 stores were converted into real, honest-to-goodness Kwik-E-Marts. 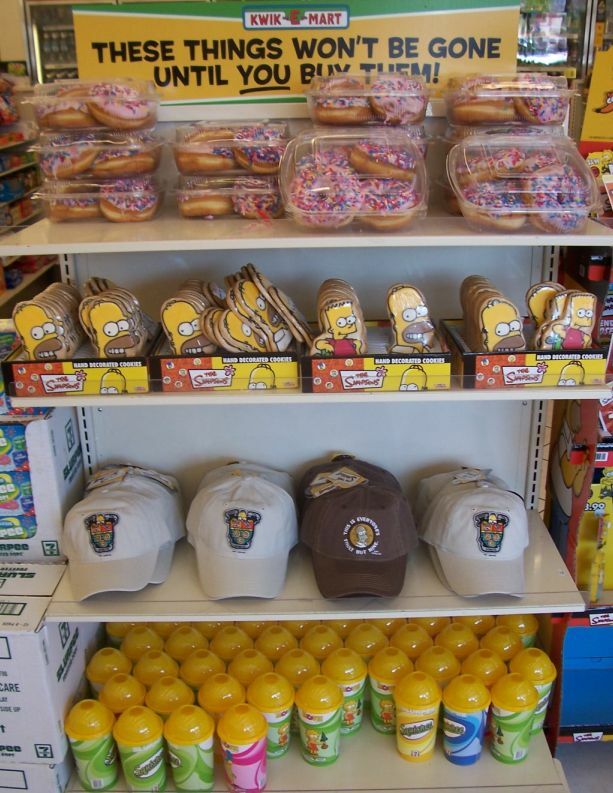 Yes, if you live in one of the 10 designated cities you too can walk into a Kwik-E-Mart and buy Simpsons branded products while plastic standees of Simpsons characters stare at you….judging you. How cool is that? Why only ten stores? Good question, but I think 7-11 is footing the bill for converting the stores for what looks to be the greatest movie promotion in the history of movie promotions. Not only are the 7-11s getting a facial, they are also going to sell products that are found in the Simpsons show. You’ll find the famous donuts with pink icing and sprinkles, cans of Buzz Cola, Raidoactive Man comics and boxes of Frosted Krusty-Os cereal. 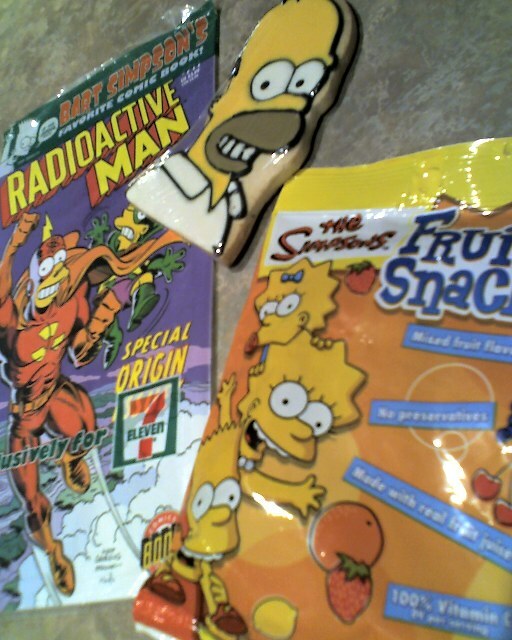 It’s a veritable smorgasbord of Simpsons goodness. The closest store to me is in Orlando, FL. It’s about 2.5-3 hours away. I really have to search inside myself to decide if a 3 hour trip (one-way) is worth it to buy a box of Krusty-Os or a Squishee. It’s really close to a yes, though. It’s hard to fathom that I am about 3 hours away from bathing my naked body in blue Squishee and gorging myself sick on pink-icing donuts with sprinkles (do-o-o-o-o-o-o-nuts). It’s too much for my pop culture addicted brain. Very, very cool. Here are some pictures I found of blogs who have already been to one of these (click the pics for links to those articles). Enjoy, and if one is near you, go check it out.